In order to mesh a revolved shape the basic outline of the geometry must be built as points and lines. These are used to create 3, 4, or 5 sided surfaces. The cross section of the rotation will be defined as a collection of surfaces. 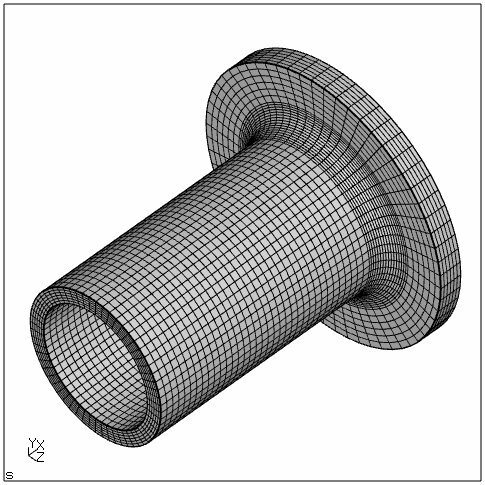 It will be necessary to impose this limit for the number of edges composing a surface in order to properly mesh the revolved shape with a structured mesh. The swep command is used to revolve the shape in four 90 degree segments with 15 divisions per segment. The batch input file is available for download from this link. This file will create the mesh shown in the following image. A snapshot of the batch file is shown below. It starts by defining the lines and points of the cross section. This is followed by discretization of the cross section into four individual surfaces. These surfaces are placed in a set and rotated about the x-axis in four 90 degree steps. The points r1 and r2 are used to define the axis of rotation. This results in four individual bodies with associated surfaces, lines, and points. Some of these are duplicates if the goal is to define a single meshed part. This problem is overcome by using the merg command to eliminate the redundant geometry. This will combine items located within a certain tolerance of one another. Each type of geometric type to merge is defined as the second argument to the command. The set is defined as the third and it is followed by the tolerance. When using this command it is important to keep an eye on the tolerance used. Too great a tolerance can lead to unexpected results. Finally the element type is defined. The user simply opens the file and types mesh all to generate the mesh. The points and lines used to create the cross section are shown below. The fillet must be divided into two surfaces with five edges each. 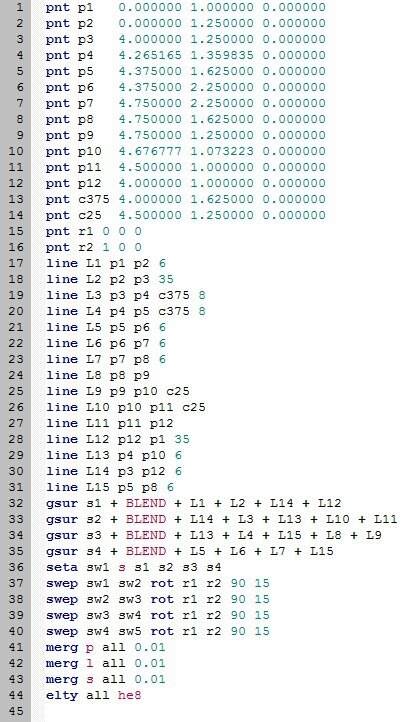 In my experimentation the lcmb command can be used to combine the individual line segments into a single logical segment which can be passed to commands. This can be used to successfully swep the fillet as a single surface. However, this method failed to generate the expected mesh. The fillet is divided with a line directly across the mid points of each arc length. 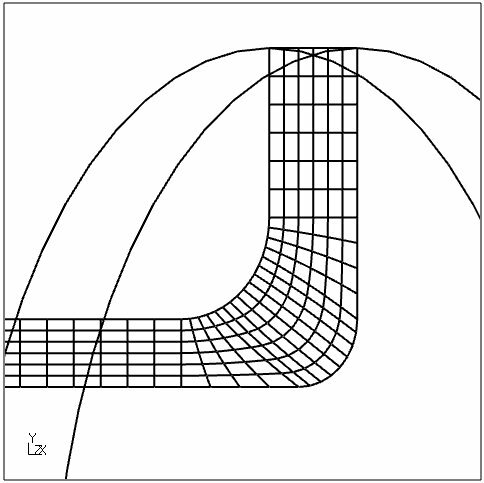 In this case the dividing line meets each arc at a relatively shallow angle. The dividing line will have an influence on the mesh quality. 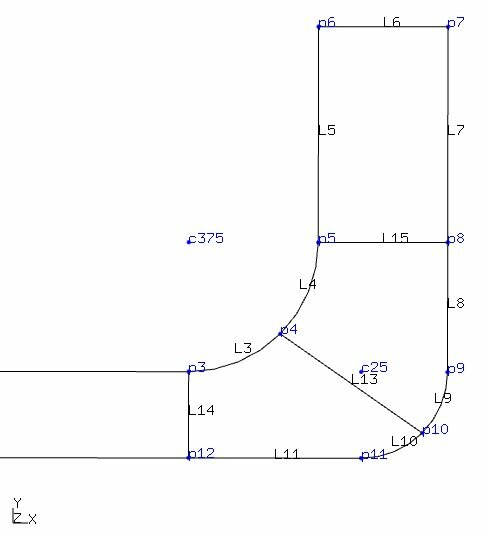 Sharp division angles will cause poorly shaped elements near the dividing line. The two points near the fillet define the center points for the radius of each arc. The two points in the lower left will be used to define the axis of rotation for the swep command. A detail view of the fillet is shown below. 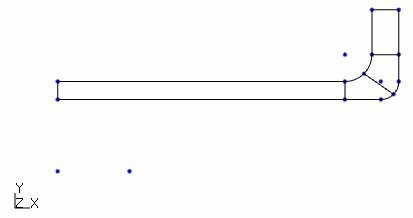 Adding the third point c375 or c25 to the end of the line command will generate an arc where the first two points are the start and stop locations about the third center point. In order to generate a satisfactory mesh for the fillet it will be necessary to treat all the edges of the two surfaces as a system when choosing the line divisions. Poor choice of division for an edge can lead to meshes with sharply shaped elements and even failure to mesh. After the mesh has been generated it can be inspected by viewing the cross section using the cut command in the cgx menu system. This is a good way to check the quality of the mesh. It should be defined with elements that are nicely shaped and have gentile transitions in size. The idea is to describe a continuum where the laws of mechanics can be applied. The image below shows the cross section view using the Viewing->Toggle Model Edges and Viewing->DOTS turned on.